German engineers have unveiled a bizarre looking one-seater cab they say could be the future for congested cities. 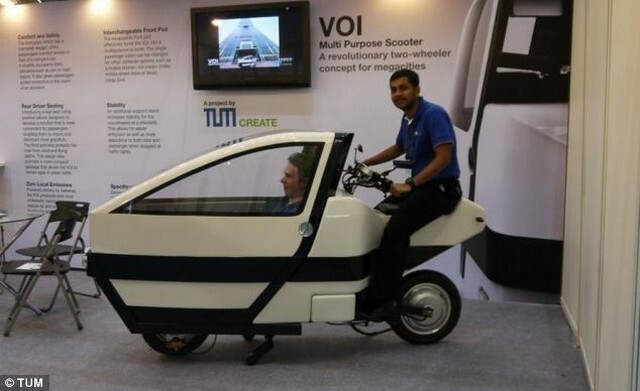 The Voi concept vehicle, developed by students from Technische Universitat Muenchen in cooperation with Singapore's Nanyang Technological University, was revealed at the at the 3rd Taiwan International Electric Vehicle Show. 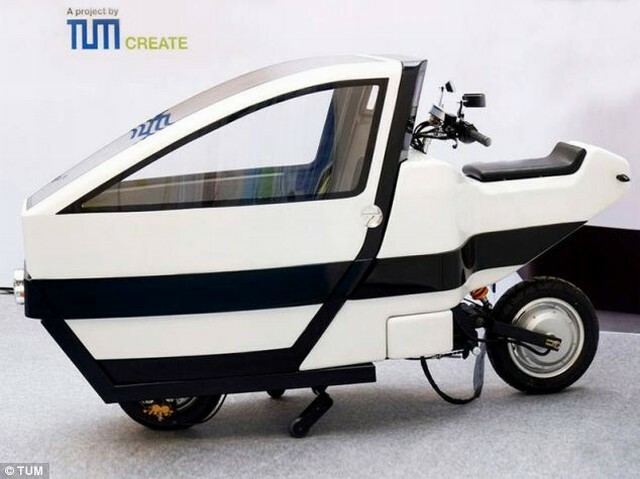 Its inventors claim it is as agile and affordable as a scooter while as safe and comfortable as a car. The 2-wheel Voi electric scooter is designed as a transporter for densely populated megacities where congested traffic is a major problem. 'For anyone living in a megacity, being stuck for hours in a gridlock is a part and parcel of everyday life,' its developers say. 'This makes it hard to travel quickly and efficiently in personal modes of transport such as a car or taxi. Positioning the driver at the rear of the scooter allows for a compact design with an enclosed passenger cabin in front that shields occupants from the elements, the designers said. The lightweight scooter can reach speeds of 30 mph with a range of around 50 miles, they said, with zero tailpipe emissions. It is also not limited to transporting passengers, the designers said - its modular front pod can be swapped for a cargo box or even a mobile kitchen, making it a multipurpose urban vehicle. In Vietnamese, 'voi' literally translates to 'elephant', and is a symbol of a safe and intelligent way of transport.